When journalists search for information, they will see that you are the explaing kind, and they will see what your topics are. Write summaries of your research (on your blog or elsewhere). At IFN, working paper summaries in Swedish are mandated (example). I hate writing them, but having written them is wonderful. Occasionally reply when others get it wrong (here's an excellent example). Yes, you should bother. It is a virtue, and it is part of your job-description. When journalists call or email, answer, reply or get back to them. Be prepared to explain stuff about research questions, uncertainty, normative vs descriptive, causation vs causality. Yes, you should bother. It is a virtue, and it is part of your job-description. If you don't know or are not sure: Give pointers to other researchers who know more, when you know these exist. Or ask for time to check the literature for 15 minutes and then get back to the journalist. You are much more productive in searching and validating research. Journalists who are not willing to give you 15 minutes to find a serious answer, are not serious. If it is radio/TV, remember that time flies and you will only be able to cover half of the most basic stuff. At best. If you are misrepresented, or if your position was too nuanced to be newsworthy, see 2. Remember that there is no reason to add a tenth point to your list just because 10 is a nice and even number. Content is what matters. I am astonished at how many students, and for that matter adults, in the U.S. honestly believe that the U.S. should model itself after Sweden because Sweden has shown that socialism works. He goes on to nicely demonstrate why this is simply not true (citing among other sources my book, Sweden and the revival of the capitalist welfare state). In particular, Munger makes an important point regarding regulation, where I would encourage Swedish policymakers to use other nordic countries as a benchmark, not the U.S. In terms of deregulation of business freedoms, measured in the Fraser Institute’s "Index of Economic Freedom," Denmark, Finland, and Norway are the 7th, 8th, and 9th most free; Sweden is 12th. The U.S.? It is 15th. The U.S. is rapidly regulating new industries, and further restricting old ones, at the state level in particular. The expansion of professional "licensing" rules, supposedly for the benefit of consumers but in fact in support of organized corporate interests, is making the U.S. less capitalist every day. A related question is if the U.S. could become more like Sweden if they wanted to. I think it might be difficult, because even for Sweden, becoming what the country is today, was a bumby road and involved a lot of trial-and-error as well as unintended consequences. I expand on those topics in my follow-up paper on Hayekian welfare states, currently being revised after some conference presentations and feedback. Here is the the most recent wp-version. The lesson for other countries from the Nordics is thus not to copy the blueprint for the Swedish welfare state, for example, but rather to foster the state capacity needed for successful learning from experimentation. Trying to build a fiscally large welfare state without the fundamentals of state capacity and social trust may turn out to be a dangerous strategy. The fact that some countries succeed in combining a large public sector with high levels of economic freedom does not mean that all countries are able to do so. Downloadable from Repec is a paper that describes the concept of a Hayekian Welfare State, and illustrates using several examples from Sweden. The idea that all types of economic freedom – including limited government – promote prosperity is challenged by the fact that some countries successfully combine a large public sector with high taxes and otherwise high levels of economic freedom. To explain the co-existence of economic freedom and big government, this paper distinguishes between big government in the fiscal sense of requiring high taxes, and in the Hayekian sense of requiring knowledge that is difficult to acquire by a central authority. The indicators of government size included in measures of economic freedom capture the fiscal size but ignore the Hayekian knowledge problem. hinking about government size in both the fiscal and Hayekian dimensions suggests the possibility of Hayekian welfare states, where trust and state capacity facilitate experimentation and learning, resulting in a public sector that is big in a fiscal sense but not necessarily more vulnerable to the Hayekian knowledge problem. Pensions in Sweden are used as a case to illustrate the empirical relevance of the argument. The new pension system represents big government in a fiscal sense, but by relying on decentralized choice it requires relatively little central knowledge. Johan Norberg and the Free to choose network have produced a new film on whether Americans would be better off if the United States was more like Sweden. I was interviewed for the film last summer and now it is out on youtube. Nikolaev, Boris, Christopher Boudreaux, and Rauf Salahodjaev. 2017. 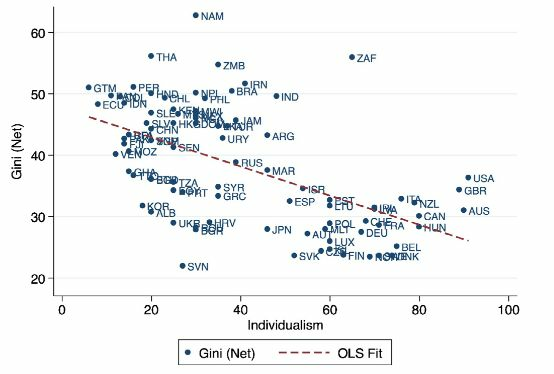 “Are Individualistic Societies Less Equal? Evidence from the Parasite Stress Theory of Values." Journal of Economic Behavior & Organization 138: 30–49. https://www.sciencedirect.com/science/article/pii/S016726811730094X (May 18, 2018). 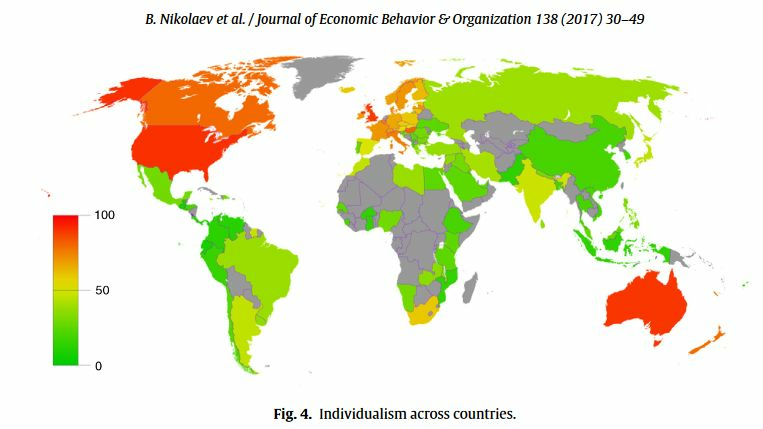 In individualistic societies the ties between individuals are loose and everyone is expected to look after themselves and their immediate family ( Hofstede et al., 1991 ). Such societies place value on personal freedom, self-reliance, creative expression, intellectual and affective autonomy, minimal government intervention, and reward individual accomplishments with higher social status. Higher rewards generate productivity that makes societies richer by channeling entrepreneurial talent into experimentation and innovation ( Gorodnichenko and Roland, 2012 ), the newly created wealth is inevitably distributed unevenly as entrepreneurs enter new markets and generate extraordinary wealth for themselves. Bergh, Andreas, and Christian Bjørnskov. 2014. “Trust, Welfare States and Income Equality: Sorting out the Causality." European Journal of Political Economy 35: 183–99. http://dx.doi.org/10.1016/j.ejpoleco.2014.06.002. A year ago I published a short paper in Migration Letters. 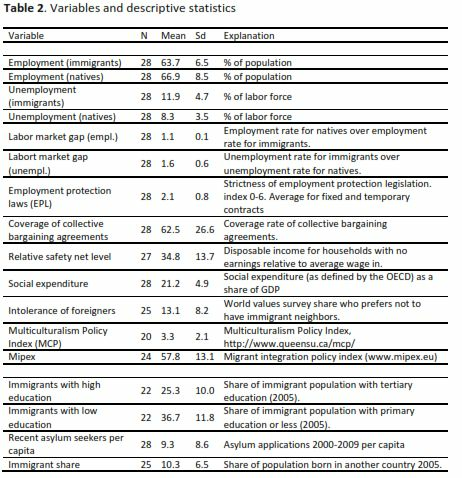 The idea was basically to examine what factors that can explain the pattern that (in most OECD-countries) immigrants have lower employment and higher unemployment than natives. Because there are almost as many theories as there are OECD countries, I used Bayesian model averaging to basically have stata run all possible regressions combining the explanatory variables (starting from row 7) below. In the paper, the main question is how immigrants fare relative to natives, so native (un)employment is always included, whereas the other x-variables may or may not belong in the model, and the algorithm will calculate a posterior inclusion probability for each variable, and a coefficient for the variable when included. In words: A model containing unemployment rate for natives and the share of the labor market that is covered by collective bargaining agreements can explain 73% of the variation in immigrant unemployment in a cross-section of OECD-countries. 10 pcu higher collective bargaining coverage is associated with 0.9 pcu higher immigrant unemployment rate. Some have asked me if the same variables explain immigrants&apos; labor market outcomes without controlling for natives&apos; labormarket unemployment. In Sweden, immigrants have relatively high employment compared to other countries, but the gap between immigrant and natives is much larger in Sweden than in most other countries. While I believe that analyzing the gap between immigrants and natives is a more appropriate research question for the method and the variables tested, it is easy to apply the bayesian algorithm to the same data without controlling for natives (un)employment. For those who are curious, the results are shown below. As explained in the paper, I test two sample sizes (with 21 and 25 countries) because some x-variables are available for relatively few countries. The variables are ranked according to posterior inclusion probability (pip), and before that the coefficient is shown. One core question permeates political economy scholarship: how is it possible to combine capitalism (free markets) with democracy (collective choice)? One produces stark inequalities in the distribution of income and wealth, whilst the other (the democratic state), in principle, is based on egalitarianism (one person, one vote). The comparison between capitalism and democracy made here (and in many other places...) is not really fair. Why? Because the (alleged) consequences of capitalism (inequality) are contrasted with the founding principle of democracy (egalitarianism). A more informative comparison would be to compare consequences of capitalism with consequences of democracy, and similarly compare foundations of capitalism with the foundations of democracy. Doing so reveals that they share some features: The are both, in fact, based on egalitarianism (everyone&apos;s right to property and everyone&apos;s right to some political rights) and they both result in some inequality (democratic influence and profits will typically not be uniformly distributed). Still, both systems are doing ok when compared to their alternatives, socialism and dictatorship. Here are my slides from my presentation at the American Public Choice Society meeting in New Orleans, March 2-4. Full paper is here. My latest piece on Sweden is out now in the Milken Review. This time I try to say something about how and why Sweden became the country it is today. Previously, I have focused on what happened, when did it happened and what the consequences were. Saying something about why it happened is much more difficult. In short, it is easy to paint a picture of wise intentional planning in retrospect, but that is typically not true when you look closer at what really happened. Serendipity and unintended consequences played important roles. The winding road Sweden has taken has made it difficult to say whether being more like Sweden involves increasing taxes and government intervention in the economy – or whether it means liberalization, deregulation and welfare-state retrenchment. So, before other countries try too hard to become more like Sweden, it is wise to look back at how Sweden came to be Sweden. In short, education promoted economic development in Sweden, but democracy at the time did not promote education. Knowing more about what actually happened in Sweden hardly leads to clearer recommendations for other countries. A Washington Consensus for welfare states? 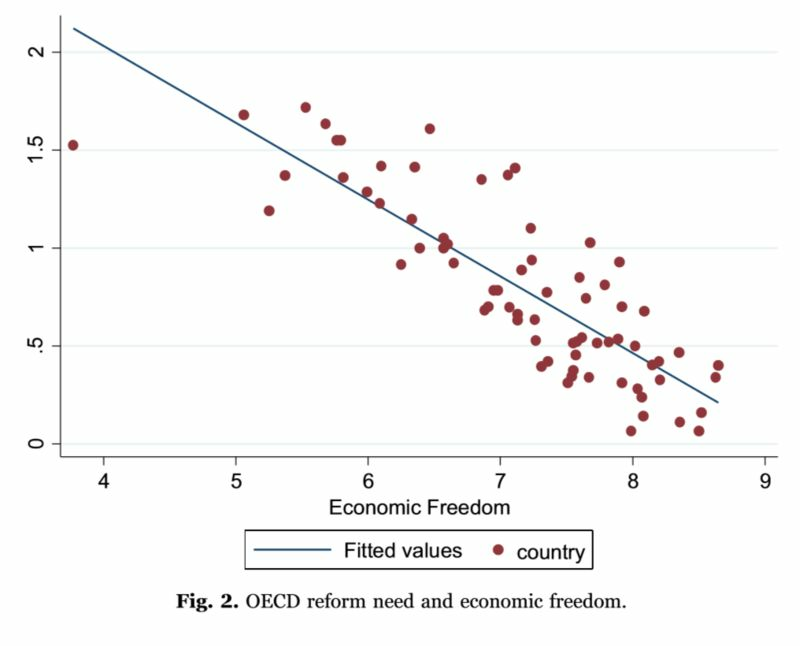 We quantifiy the perceived reform need and examine its correlates, which led to an interesting discovery: The reform need according to the OECD is highly correlated with the Fraser Institute&apos;s Economic freedom index. We also examine if perceived reform need predicts subsequent policychanges. Using the Comparative Welfare State Entitlement dataset, we find some evidence that a high reform need is followed by lower welfare state entitlements in countries with a right-wing government, and higher entitlements in countries with a left-wing governments - but these results are not causal, ie these changes may well have ocurred regardless of what OECD recommends.